Do you have leftover roast chicken, have you had a party and you have leftover antipasto type ingredients. 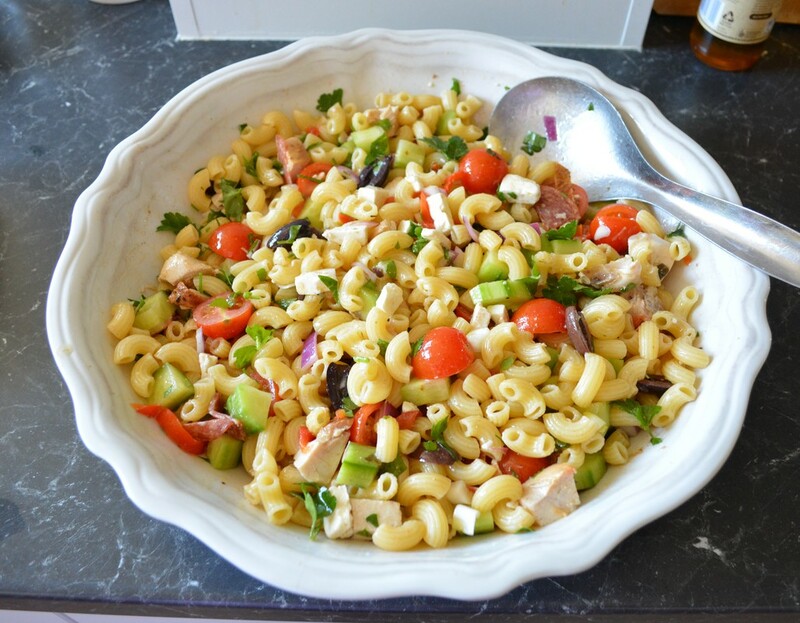 Do you love a pasta salad. If yes, this is the recipe for you. This pasta I make with leftover roast, usually the breast as my family always leave it, and the rest of the ingredients, most are found in my refrigerator, as they are sandwich fillers in my house. This salad was so delicious, it is simple and packed full of flavour. The chicken breast was great, I loved adding cucumber to the pasta salad, never thought to do that before. It was great the next day also. It is a great refrigerator cleanser, post party, clean out all the bits and pieces you have left behind. This would be great to take on a picnic, it can be prepared in advance, and is not messy to eat, one plate, one fork, lunch done. Use pitted kalamata olives if you prefer, or whatever olives you have at home. You can use ricotta salata cheese, grated, instead of feta. ​With the dressing, add more if you think it needs it, it is to taste. I prefer home roasted capsicums, but in this you can use the ones out of a jar, it takes great either way. If I've had a party and I only have sliced salami at home, I just tear that into the salad. 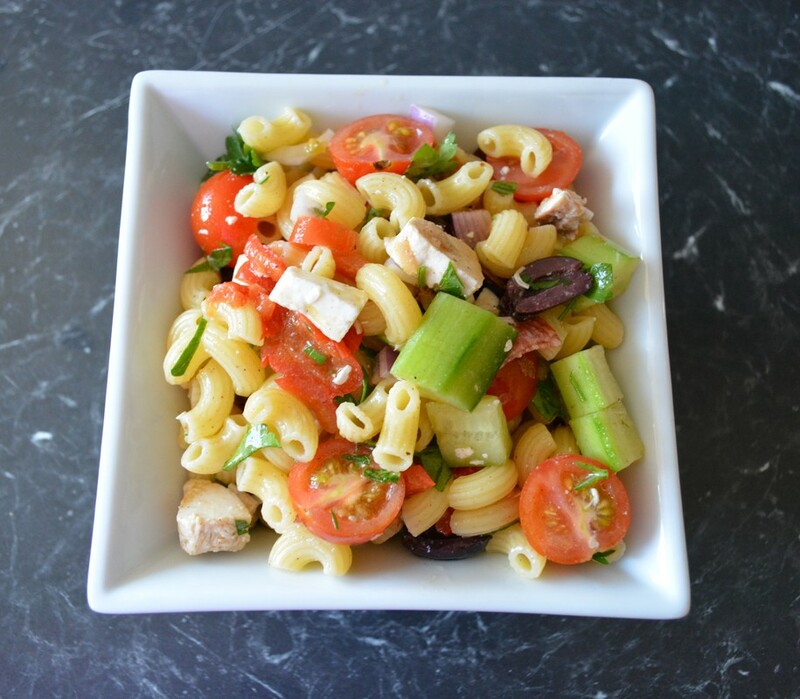 This pasta salad will now be my go to recipe when I have leftover chicken. I truly enjoyed every bite. Bring a large pot of salted water to a boil. Add the macaroni and cook until al dente, according to the package directions. Drain in a colander, rinse with cold water and shake until very dry. Transfer the pasta to a large mixing bowl, drizzle 2 tablespoons of the olive oil over it and toss well to coat. Add the chicken, cucumber, tomatoes, olives, capsicums, salami, onions and parsley. Season with salt and pepper, toss well to combine. In a small bowl, whisk together the vinegar and remaining 1/2 cup olive oil; pour it over the salad and toss well. Taste and adjust the seasoning if necessary. For best flavour, let the salad stand at room temperature for about 30 minutes before serving.